Program for the Holiday Happening celebration, "Down Home for the Holidays". 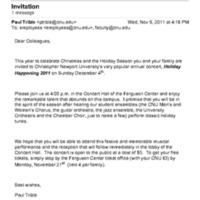 1.9 V Save the Date for our Holiday Happening Concert! 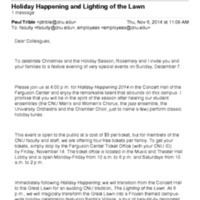 An invitation to the Holiday Happening concert and the Lighting of the Lawn on December 7, 2014. Program for the Holiday Happening celebration, "Santa Claus is Comin' to Town"